One night in the Dark-and-really-scary-forest an alchemist slash magician named Rickarius worked in his magic lab. As the result of a terribly foolish mistake one of the spells went wrong and he turned himself into a silly raccoon Rikki. Now the only hope is for the unlucky dud to become a human again if the raccoon learns alchemy, makes the philosopher’s object and unspells Rickarius. But without you this cute but not very smart animal will mess everything up. Please help the Alchemist out! Pleeeease! This rescue mission has 3 levels. You can save Rickarius only if you make the way from a Student through a Master and become the ultimate magical Alchemist. 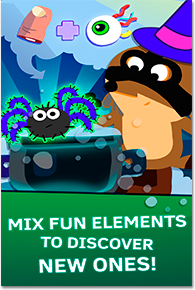 In the magic lab you need to mix various ingredients to create elements that will help you in the search for the philosopher’s object! Bats, frogs, mushrooms, rats, spiders, worms – the creepier the better. Every new element lights a candle which gets you closer to your goal. 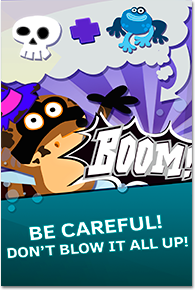 Light all candles, upgrade your magic pot and save the sorcerer! 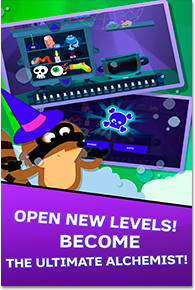 Grab potions and let’s play magic spell casting games! * These fun riddles work perfectly on smartphones and tablets. 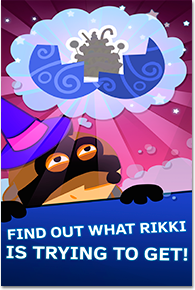 Rikki’s Magic Lab is a universal app in educational puzzle games that is good for both phones and tablets so that you could enjoy it everywhere and whenever you want! Marvelous world of magic games for girls and boys is waiting for you!